Inclusion Check-in: Are Integrative Practices in New Federal Opioid Legislation, National Academy, and FDA Activity? One can easily count the chickens of non-pharmacological approaches highlighted in multiple organizational guidelines and state strategies related to pain and opioids. But one definitely cannot count on them hatching inside each new, significant policy initiative. Regular medicine tends to regress toward a non-inclusive mean in pain treatment. And “mean” may be the operative word – at least from the perspective of individuals who remain unaware of the integrative therapies and practitioners that may help them. This is an irregular Integrator look at the level of inclusion in recent major initiatives related to pain and opioids. To start, the federal opioid legislation – then two from the National Academy of Medicine and late breaking from the FDA. On September 10, 2018, the US Senate HELP Committee published a 3.5 page executive summary of the version it passed of the Opioid Crisis Response Act of 2018. The Senate promoted its version of the legislation as the result of 6 bipartisan hearings involving an alphabet soup of federal agencies (FDA, NIH, CDC, SAMHSA) plus governors, pain experts, and individuals caught in the crisis of unbalanced chronic pain management. The very first charge, for instance, is to the NIH to find a new, non-addictive pain-killer. That sets the tone. It is not altogether a surprise that the 7 sections and 29 sub-sections of the summary do not include any explicit mention of “complementary” or “integrative” modalities or practitioners. What would be shocking if we were not de-sensitized by the expectation of pro-pharma pandering of Congress is that the term “non-pharmacologic” didn’t make the HELP memo at all. This is despite their elevation in multiple recent pain-related recommendations (see examples in this article and again here). Section 1301 on “Clarifying FDA Regulations for Non-Addictive and Non-Opioid Products” focuses mainly on drug solutions but potentially pushes a door ajar. Section 4203 on “Opioid Addiction Recovery Fraud Protection” includes “supplements” as possible agents that may be used with fraudulent promises. One hopeful sign is a section related to the Substance Abuse and Mental Health Services Administration. This includes a call for Comprehensive Opioid Recovery Centers that are meant to “provide the full continuum of treatment for patients in areas hit hardest by the opioid crisis, this would authorize a grant program for entities to establish or operate a comprehensive opioid recovery center and would require centers to serve as a resource for the community.” Multiple efforts to support mental health and behavioral health services are referenced – which are good steps beyond pharma – including a program to allow masters level, licensed substance use disorder treatment counselors to receive loan repayment for practicing in underserved areas. Nothing on non-pharma approaches. The steering committee consists of 5 medical doctors, a PhD and an attorney. There is hardly a whisper of the interprofessionalism that, under the predecessor of current NAM president Victor Dzau, MD, another part of NAM is promoting. The inclusion of Ruth Katz, JD, MPH, one of two women among the 7 and the vice president and executive director for the Health, Medicine and Society Program at the Aspen Institute, appears to be a possible open door. 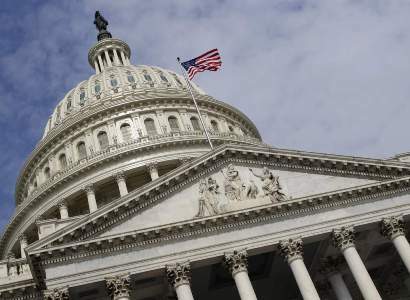 However, that group’s 5-“big ideas” for resolving the crisis in The Hill – co-signed by former HHS secretaries Kathleen Sibelius and Tommy Thompson – only went so far as to mention the importance of behavioral and mental health. No non-pharma beyond this. The Opioid Action Collaborative’s list of “Participating Organizations” also puts NAM out of step with era of interprofessionalism that is a hallmark of value-based medicine and achieving the Quadruple Aim. The NAM circle opens beyond MDs only to include the American Association of Colleges of Pharmacy, and dentists. Nursing is not even represented, nor social work, nor major organizations representing behavioral and mental health. The accepted membership of the patrician 1950s dominates. No surprise then that profession linked to the licensed integrative medicine fields or acupuncture and chiropractic and Yoga and mindfulness and the other methods many citizens are using to limit drug dependence were not invited to the table. Action: In this instance, I directly contacted NAM staff to see if this was one of NAM’s “pay to play” initiatives. If so, an integrative health organization such as the Consortium or the Collaborative might hustle up the money to insure that individuals skilled in integrative pain care were at the table. 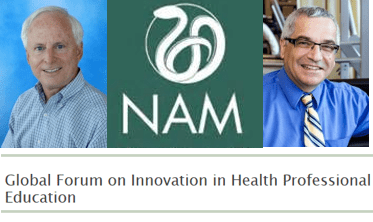 (There is precedent: the Academic Collaborative for Integrative Health (“The Collaborative”) paying dues for the past seven years, through a philanthropic gift, to participate in the NAM Global Forum on Innovation in Health Professional Education. See segment below and Widening the Circle: ACCAHC Report from the 1st IOM Global Forum on Interprofessional Education .) The response I received now two months ago was that the NAM initiative was not organized in this methods and such a door was not open. I urged that NAM place someone with expertise in the dialogue onto the steering committee or in a consulting role. This led to some interest, even openness to one of the professionals who could represent multiple integrative professions who I suggested. As of today, the individual has reportedly been approached but no position secured. Bottom line: medicine’s regression to its comfort zone of a reductive, mono-professional mean is apparently continuing in full force. Co-chairing the upcoming workshop are Daniel Cherkin, PhD from Kaiser Permanente and Anthony Delitto, PhD, PT from University of Pittsburg. Cherkin is a well-known researcher in complementary and integrative practices for back pain. He has served as the program director for the major research meeting of the Academic Consortium for Integrative Medicine and Health (The Consortium), and, briefly, on the Research Working Group of the Collaborative. Delitto has a history of collaborative research at U Pitt, with chiropractor Michael Schneider, DC, PhD and others in his rehabilitation department. The website for the upcoming workshop does not presently include a list of the committee members who typically guide such processes. I have heard via the grapevine that Elizabeth Goldblatt, PhD, MPA/HA, who serves as the Collaborative’s member on the Global Forum, is serving on this group. While it is good news to have a representative from the licensed integrative healthcare fields represented, and Goldblatt has a history of networking with key players in the integrative health and medicine space, she hasn’t the depth of clinical or research familiarity that Marinelli and others in the field have. Hopefully, the committee will include subject matter experts from the integrative practice fields and Goldblatt will have an opportunity to connect the committee with others who live, eat and breath the integrative pain environment. . Examine health professions’ current approaches for educating students, trainees, and practicing clinicians on nonpharmacological pain management, and discuss potential next steps to improve training and education within and across health professions. Cherkin and Delitto can draw on a broad network of complementary and integrative experts if they chose. A minor concern is with a reductive decision that Cherkin’s former employer Group Health Research Institute made in 2010 when its prescient paper on the opioid crisis made no mention of any value from complementary and integrative strategies. This stemmed apparently from a decision to only examine research that specifically looked at complementary and integrative methods for people on opioids – there were then very few – rather the considering the problem in the broader context of the nation’s failure to appropriately utilize all possible resources in a chronic pain strategy. The workshop objectives, and language, suggest a broader framework. Twillman notes that this list is not inclusive. 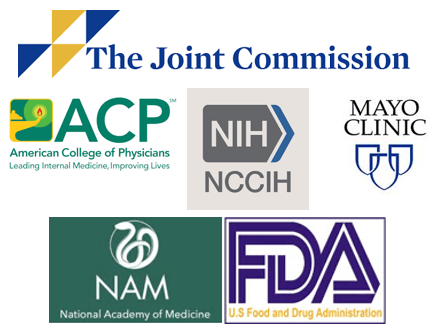 In themselves, these are good steps from an FDA that many in the alternative-complementary-integrative zone would assume – by their own biases – would be the last federal agency to promote broader education about, and use of, non-pharma approaches. The FDA’s 42-page strategy teaches that it serves none of us to regress to a pre-integrative, polarized mean.